And now we move eastward towards Poland. The weather was right so we decided to move on from Calau and head for Guben, a town on the Neisse River to the northeast. The Neisse River is the border between Germany and Poland. First we rode to the Calau unmanned railway station where, after several unsuccessful attempts to get tickets from the ticket machine, we decided to take a chance and board the train without tickets. We had been told that if you don’t have tickets you need a pretty good excuse for not having them otherwise you get fined. Bev in her wisdom photographed the ticket display screen and the Calau station sign so if we were challenged she could show the conductor our efforts and that we boarded the train at Calau and not some station further back down the line. We saw no conductor until after we changed trains at Cottbus. He believed our story and issued us with tickets. Not a lot of kilometres achieved today but what we did was hard going as it was mostly up hill. On the train there was a group of young people who were drinking alcohol, both beer and spirits. When they were about to partake of the small bottles of spirits they knocked the screw lids in unison on the wooden armrest, opened the bottles and gulped the contents down in one go. To us this was very strange behaviour, maybe it is an East German or Polish custom. Guben railway station is located some kilometres out of the town centre and even though we had directions to the town we turned right instead of left and found ourselves heading in entirely the wrong direction. Turning in the wrong direction often happens to visitors from the southern hemisphere when they visit northern hemisphere climes. After getting directions from a local we finally found the centre of Guben. From Guben town (Germany) we crossed to Gubin in Poland for the ride uphill to our hotel. 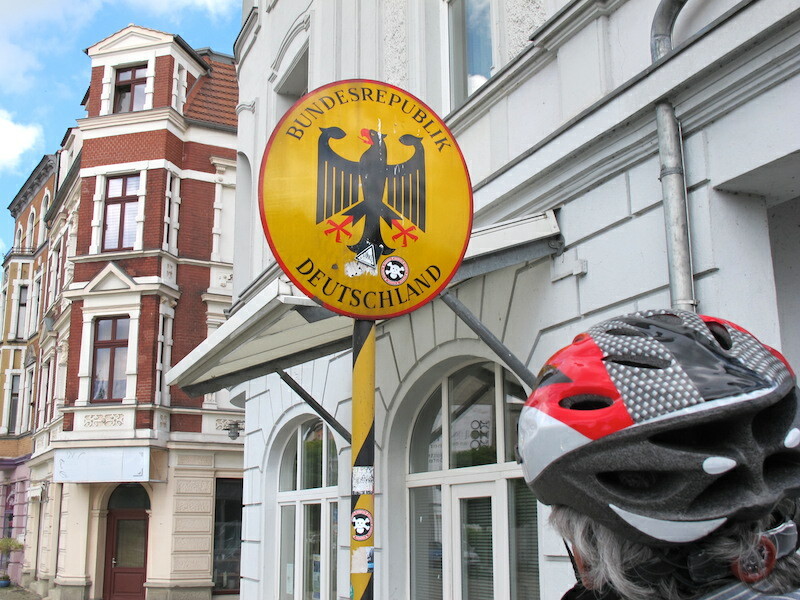 We have decided to ride towards the Baltic Sea on the German bike paths then each night take accommodation in Poland where the cost is half that of Germany. Gubin didn’t exist prior to 1945, but at the end of WW2 the Oder and Neisse Rivers were chosen as the new border which meant the town of Guben was split in half. 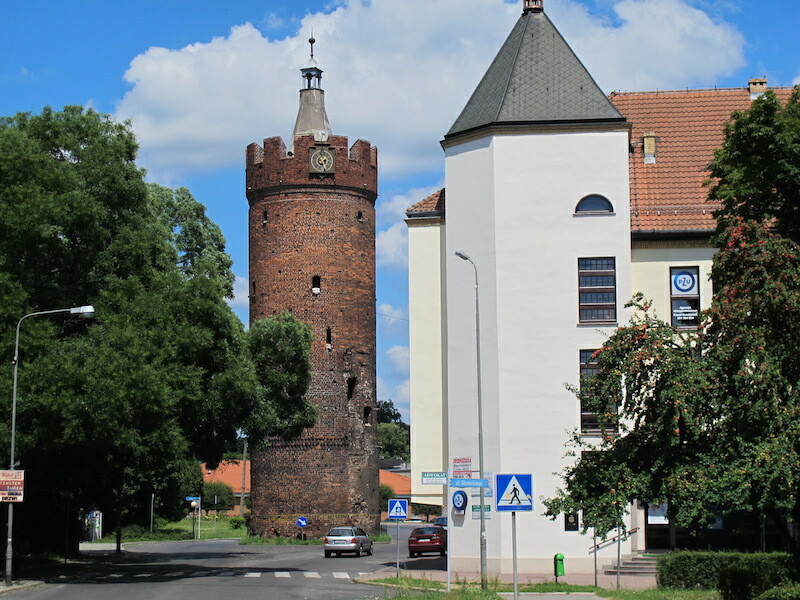 The historic centre on the Polish side became known as Gubin. 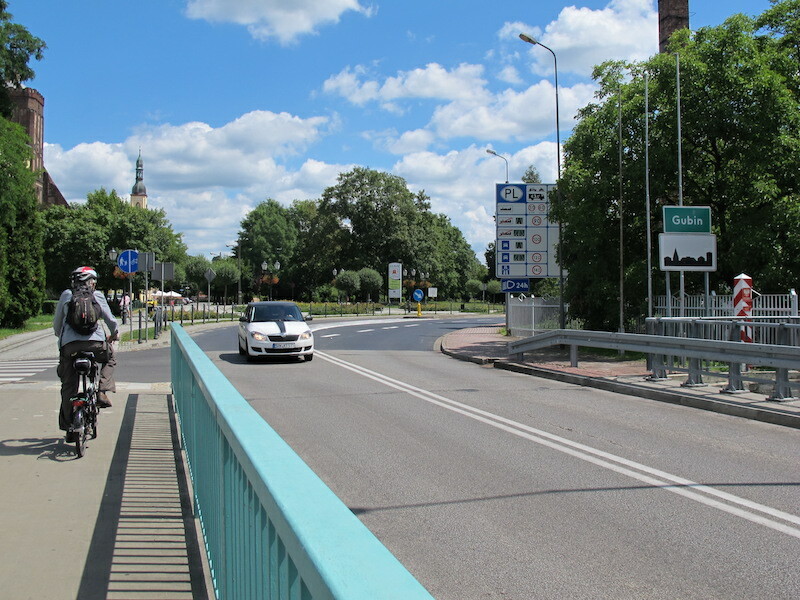 Crossing the Neisse River into Poland. 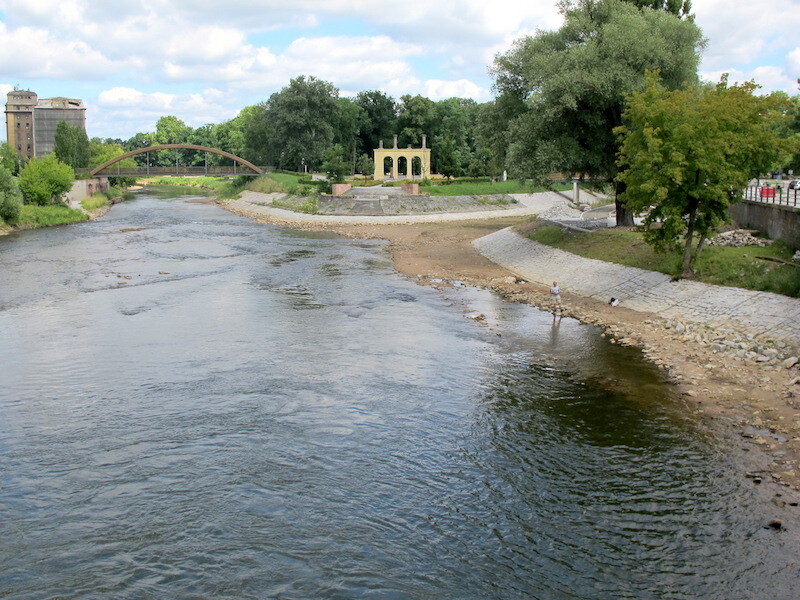 The border of Germany and Poland, looking downstream (north). Germany is on the left bank and Poland on the right. The arches are standing on Theatre Island. The island above was called Theatre Island because in 1874 a seven hundred and fifty seat theatre was built there. The theatre survived WW2 but was burnt down a few months after the war ended. Prior to the theatre being built the island was known as Marksman Island as there was a rifle range there. The island was no-mans-land prior to 1945 but is now used by both Germans and Poles. Bev and I rode to the island park and repaired a puncture caused again by a sliver of glass. Broken bottles on the pavements and road edges in both East Germany and Poland are a problem as they were in Prague and Dresden. 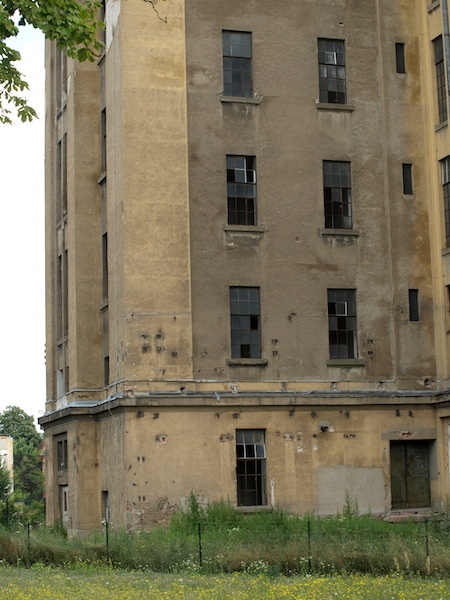 Bullet-ridden derelict factory on the German side of Theatre Island. 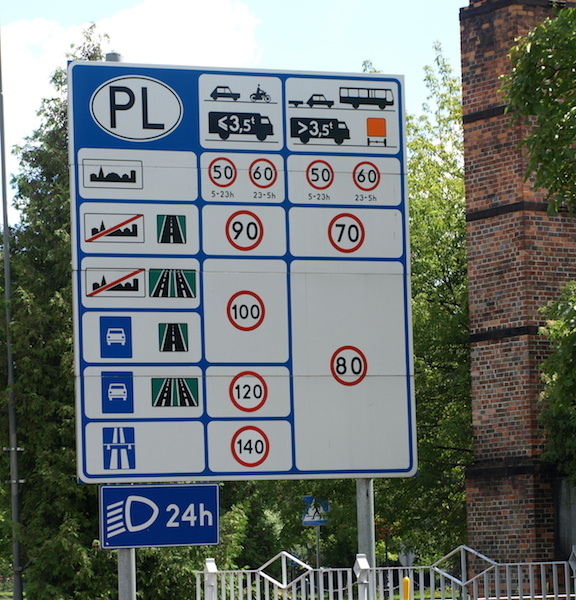 Polish road authorities making sure visitors to Poland understand the road rules. Note that vehicle lights are required to be on during both day and night. There is no passport or customs control on the border but there was, at first glance, what appeared to be a duty free zone on the Polish side. 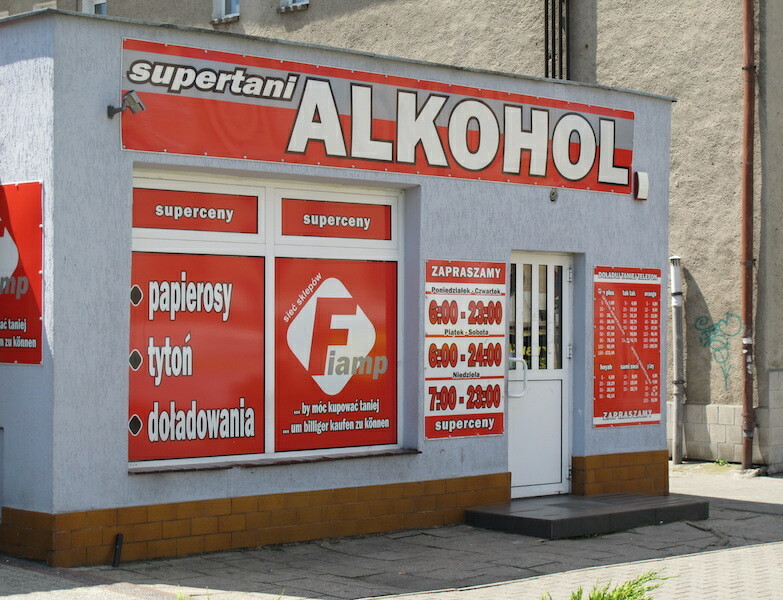 I was later informed that there is no duty free zone but simply ordinary shop owners cashing in on the fact that products and services are much less in Poland than in Germany. Germans living in close proximity to the border can avail themselves of less expensive goods such as alcohol and cigarettes. 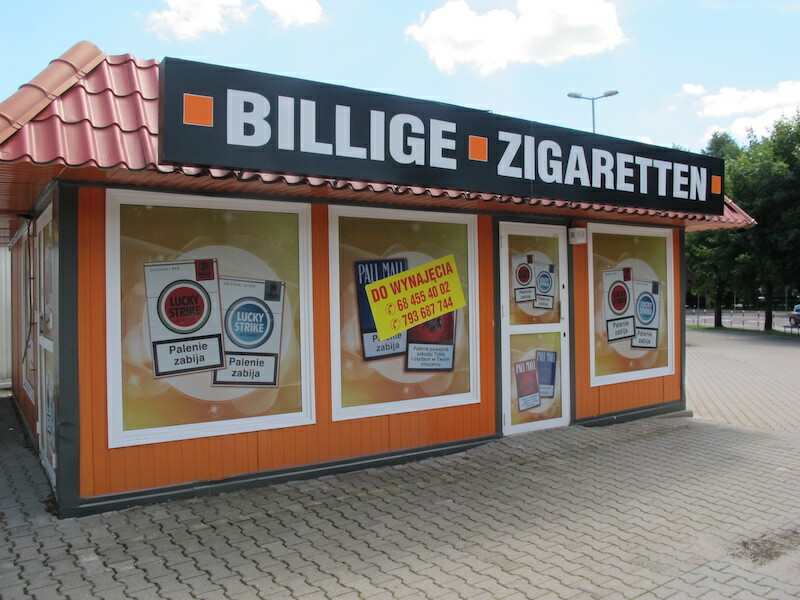 One of the many tobacco shops across the Polish border. A couple of the many beauty treatment shops just across the border. There were also many solariums. 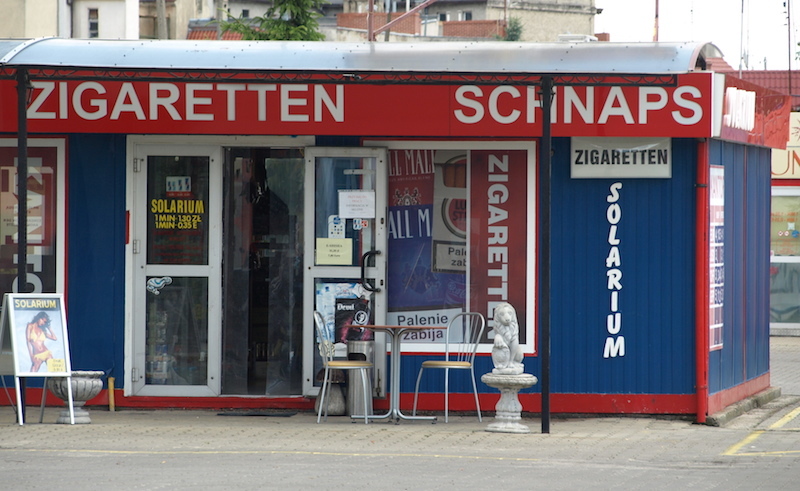 A three-in-one shop..cigarettes, alcohol and a solarium. From our observations, a number of Polish and East German women delight in having suntans and a solarium tan is the only way to get one. In many countries throughout the world solariums have been outlawed as they emit UV rays causing melanoma of the skin and eyes. As we crossed from Germany to Poland today we felt a sense of excitement and it related to the fact that we were entering a country we have not visited before. Poland is different as it has been squeezed, manipulated and dominated by other countries, namely Germany (WW2 period) and communist Russia (1945 -1989). From what I understand there is still a lot of prejudice, particularly in the older generation, against some of the past occupiers and it will probably take a couple of generations to forget and forgive those occupiers of the past. 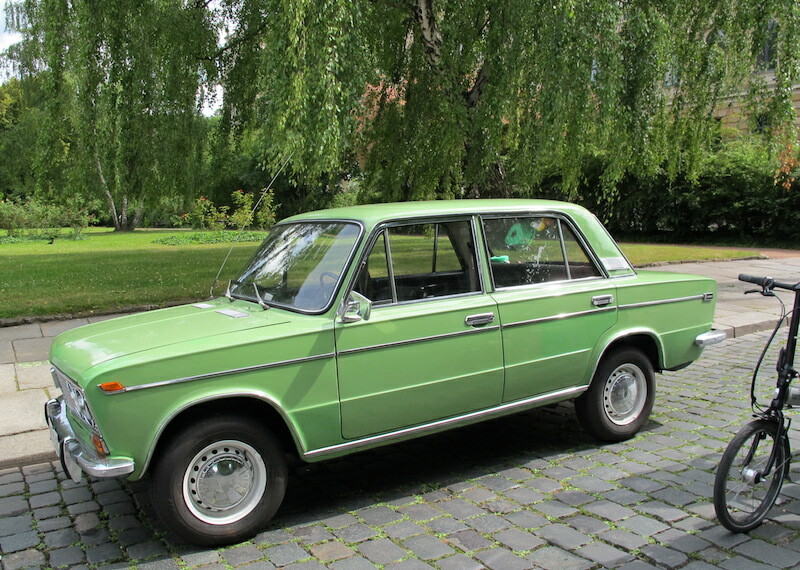 I was told that some Poles who have a distinct dislike for Russians have retaliated by urinating on the door handles of the Russian-built Lada Niva cars and some shops are boycotted because the owners were once members of the polish secret police. Restored Russian built Lada Niva. Our accommodation for the next two nights is in the Onyx Hotel and, although it is located up hill and about six kilometers east of the border into Poland, we are pleased with our selection as it is in a rural village area so there are many backyards and farmyards to look into. 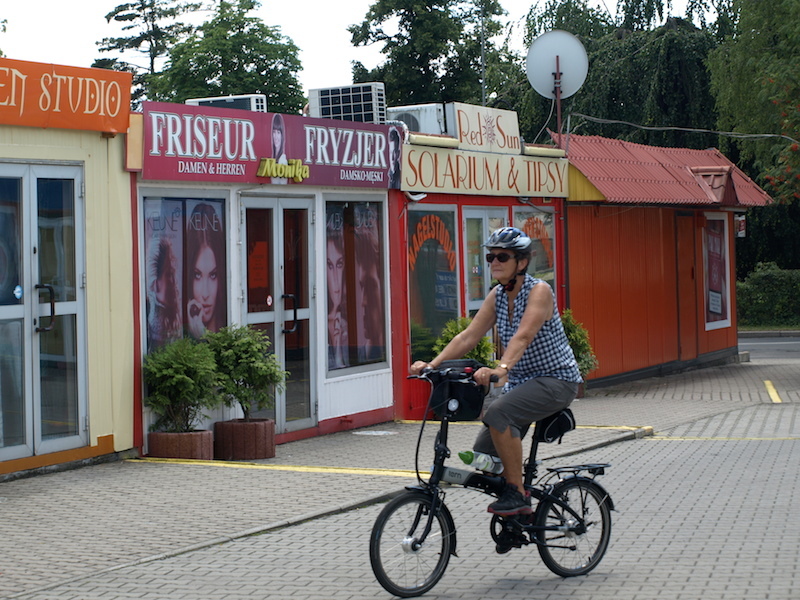 It is possible to get a three star hotel in Poland for as little as $40-00 per night. Hotel Onyx, Gubin. I think it should be renamed the Grand Onyx Hotel. A shop sign Bev was rather taken with. I’m not telling you what the shop specialised in; it‘s for you to guess. The answer is at the end of this post. SUNDAY 6th JULY OUT and ABOUT GUBIN and GUBEN. Few travellers stay in Gubin for two nights but we are, as yesterday when riding to our hotel we spotted a couple of buildings that we think require closer examination. 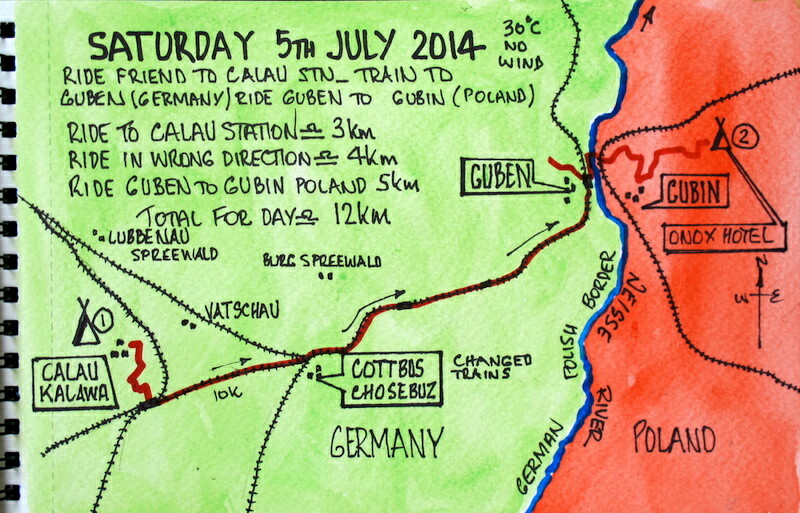 At the start of our day today we relished the downhill glide of six kilometres back to Gubin from the hotel. 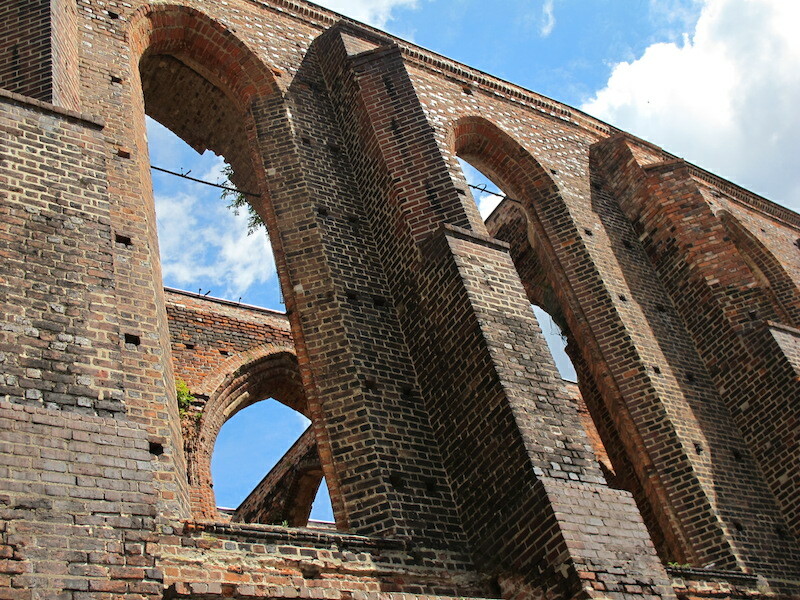 Out first stop was to explore the Parish Church, an imposing structure in ruins. The first mention of the Parish Church was in1324. It was burnt at the end of WW2 and is now considered to be a stabilized ruin. 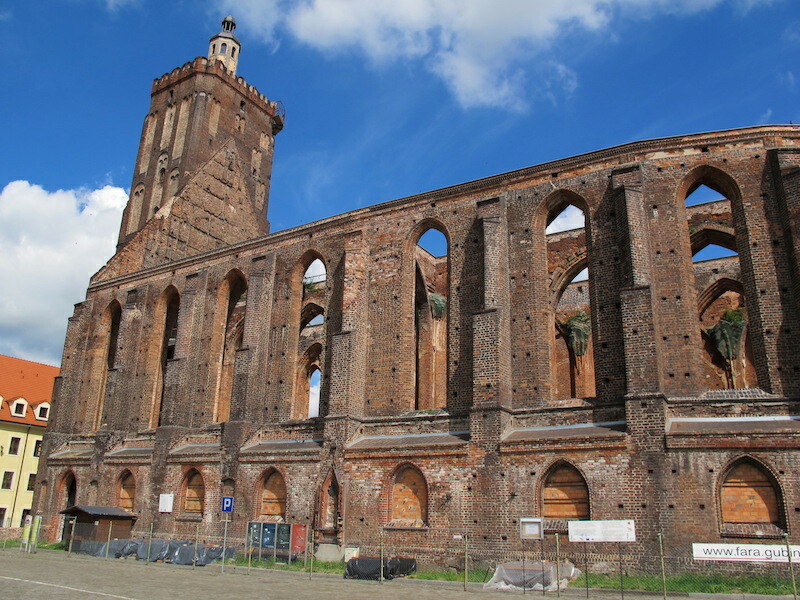 The church is a massive structure and it is a testimony to bricklayers of the past. Note the scaffolding holes in the walls similar to the holes in our friend’s barn at Calau. 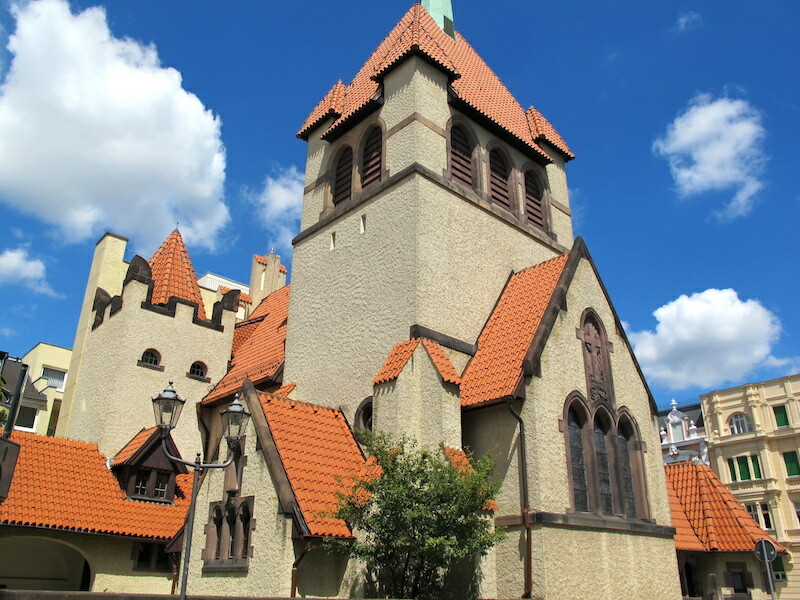 There is a rather interesting story about the church. When the town of Gubin was under siege some centuries ago a nun took a goat, water and feed into the attic of the church and hid there. She fed the goat the grass, milked it and she survived by drinking the goat’s milk. 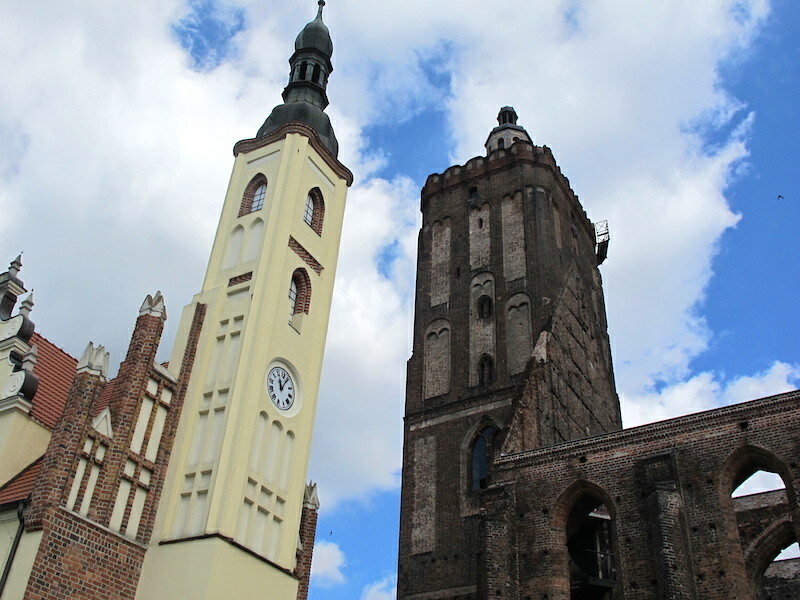 The twin towers of the Parish Church tower (right) and the restored Town Hall tower. Near the church was a flower market and by the number of stallholders it seems that flower and potted plant selling is an easy way to get into business. 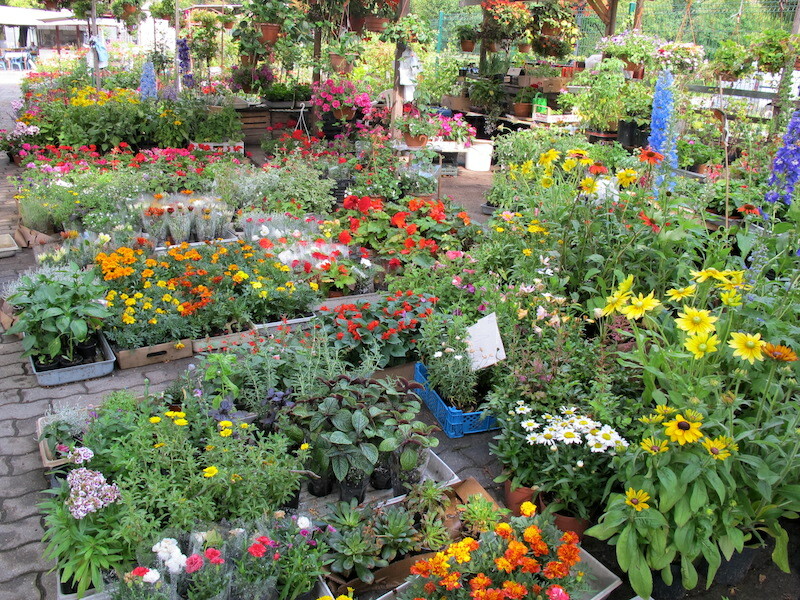 Flower growing and selling has been a traditional activity in the area for many years. A few of the many flower stalls, Gubin market. Hydrangeas. This particular flower seems to grow especially well in the northern part of Germany. Whenever I see hydrangeas I always think of my mother as she had a particularly ‘green thumb’ when it came to growing them in the garden of our family home in Sydney. My mother had little education as when she was twelve years old her mother died and she and her older sister had to leave school and look after her seven brothers and father. 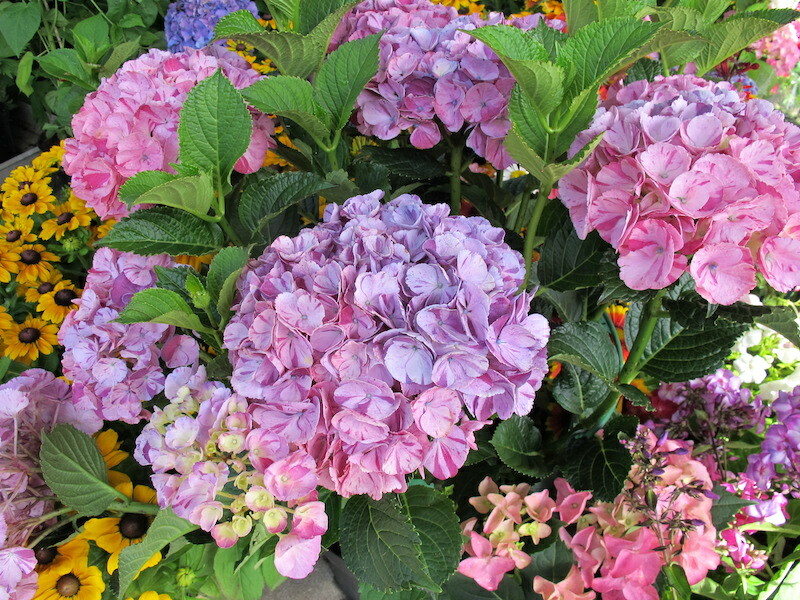 One of the by-products of not being educated was she often mispronounced words and an example was ‘drangea’ for hydrangea and ‘sinerator’ for incinerator. As a remembrance to my mother we always call them ‘drangeas’. Crossing back into Guben in Deutschland. 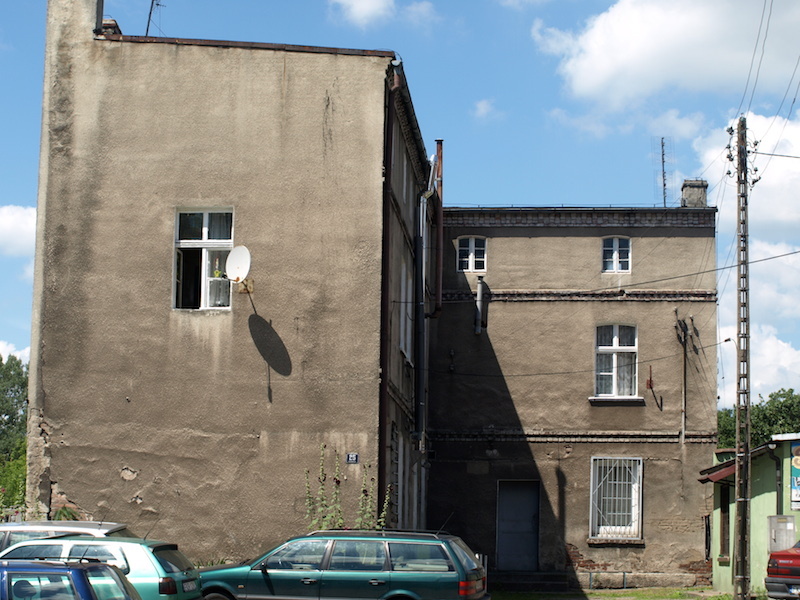 In the old communist towns of East Germany and Poland there are still many ‘communist grey’ buildings. In the times of occupation there were no coloured paints or oxides available to tint mortar or stucco, the only colouring was cement grey. Of course, today, all colours of the rainbow plus more are available to renovators so restored buildings are bursting with colour. The following photograph is an example of a communist grey building. 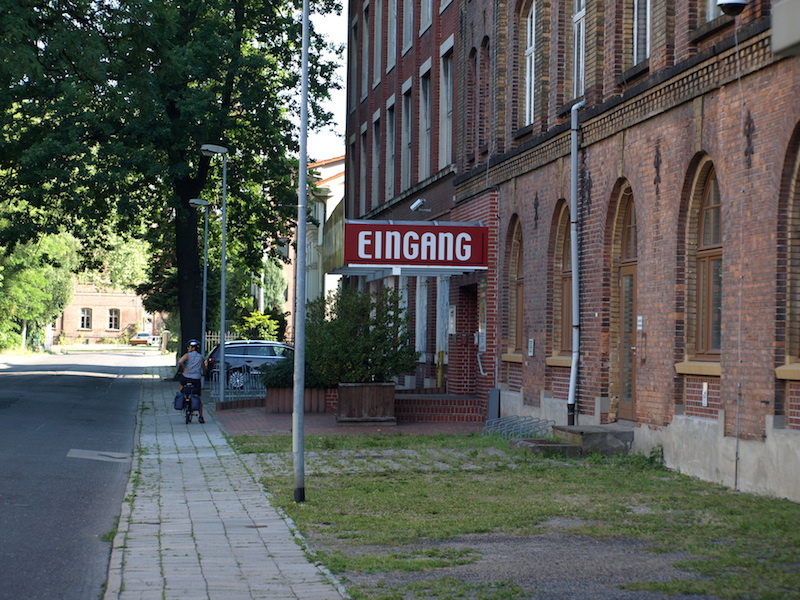 Since unification the East Germans have restored many of their buildings, obviously due to a more affluent economy. In Gubin, a communist-grey building. 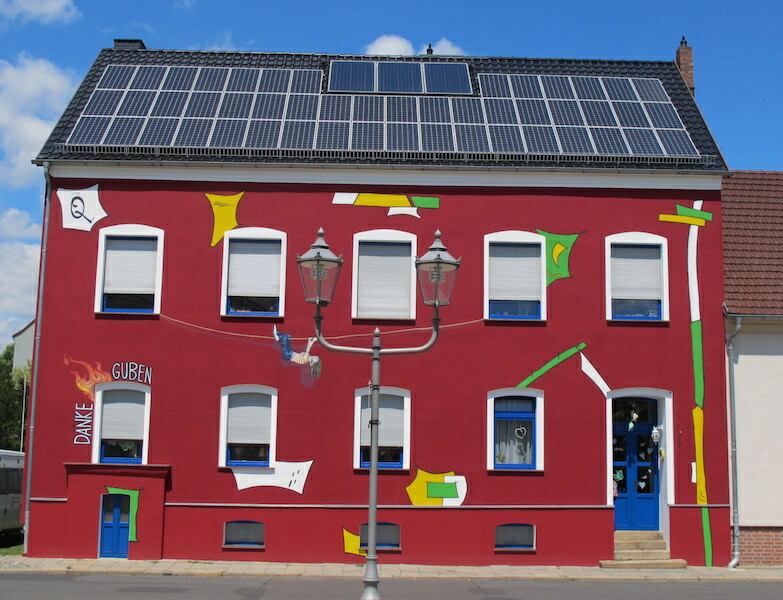 A Guben building bursting with colour. Note the solar panels on the roof. 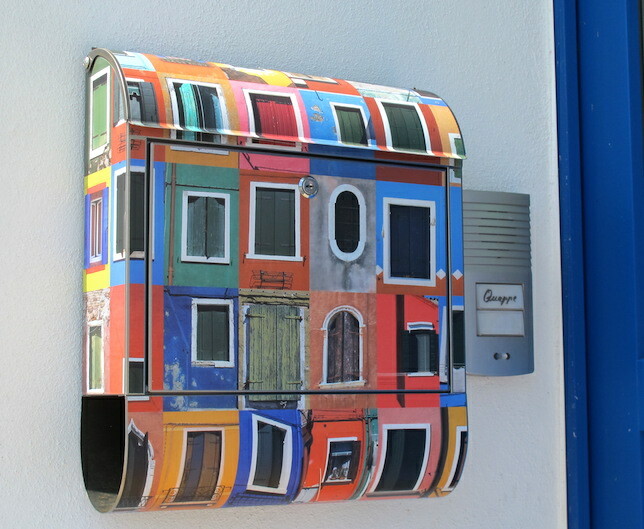 The colourful letterbox on the colourful house. In Guben, the Church of the Good Shepherd, built 1903 in art nouveau style. Before drawing this post to an end I have to share with you a couple of architectural treasures we found in Gubin. A Gubin mansion. 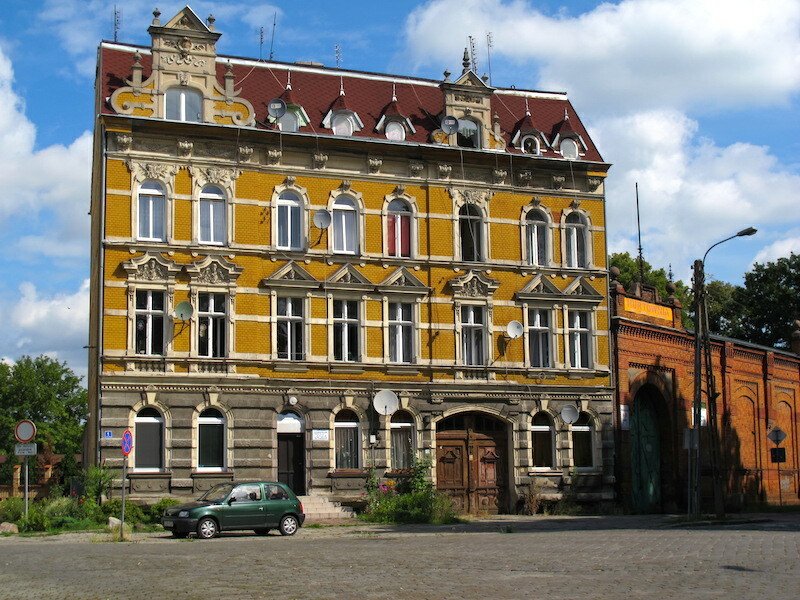 I don’t know what such a building is called in Poland but for the want of a better name I have called it a mansion. What I love about this building is the variety of dormer windows, decoration variation around each window and the differing shape of the parapets. Whoever designed the front of this building did it with flare. 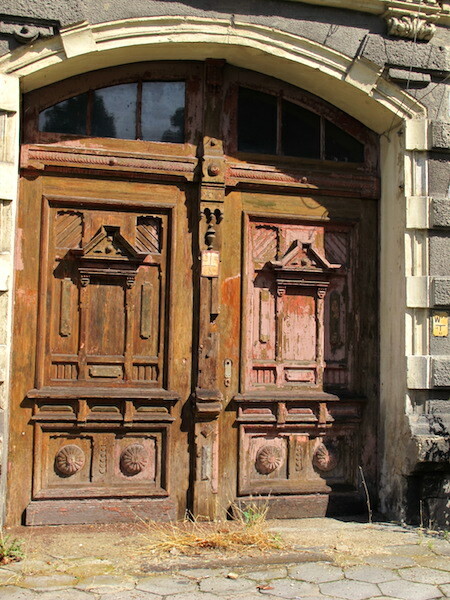 The front doors of the mansion, a restorer’s delight. I suspect this entranceway led to stables. In Gubin, the Fat Tower, part of the now non-existent wall fortification. Built around 1530. Because early tomorrow morning we are going to ride the D12 bike path to Eisenhuttenstadt we thought we would check out exactly where it started. An easily missed start of the D12 bike path to Eisenhuttenstadt. The path looked so inviting we decided to follow it for a few kilometres and I’m glad we did as followed a meandering creek shaded by old knarled London plane and oak trees. We thought if the ride tomorrow was going to be similar all the way to Eisenhuttenstadt it was going to be a very pleasant ride indeed. Unfortunately we broke out of the sheltered path and emerged into an old industrial area, which for me was not a negative as I love speculating what the buildings housed in past. Chimneys, steel gussets protruding from walls, cooling towers and debris lying around in overgrown yards tell the stories. One massive complex we rode past was an old weaving mill but these days it houses the Guben Plastinarium. The entrance to the Plastinarium. The Guben Plastinarium is open to the public but unfortunately it was near closing time so we didn’t go in though I did manage one photograph through an open door. A photograph I shot through the open door. ‘Von Hagens Plastination offers one-of-a-kind, real human specimens, preserved through Plastination, exclusively for medical teaching, anatomy labs and instruction. These anatomical teaching resources are made possible through the revolutionary specimen preservation process of Plastination, invented by anatomist Gunther von Hagens, founder of von Hagens Plastination. Through Dr. von Hagens science – a unique collaboration between the Institute for Plastination’s body donors, the plastination anatomists and technicians, and educators like yourself — future generations will be able to gain knowledge of human anatomy that was previously unavailable’. Again, that is the end of another post. We trust you have enjoyed reading about a seldom visited part of the world. We have enjoyed the journey and we are pleased we have crossed another region off our bucket list. 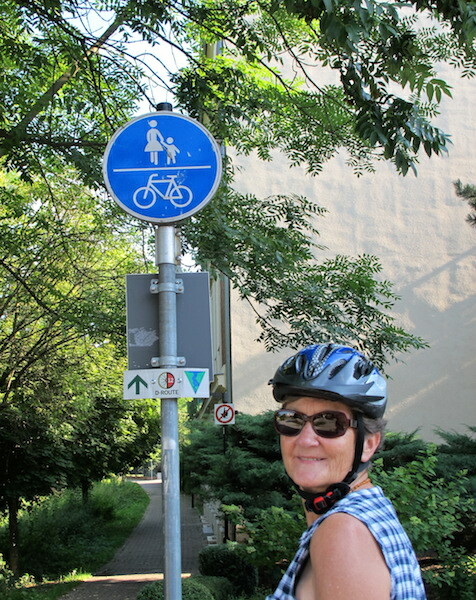 The next post will relate to a rather strenuous ride from Gubin to Eisenhuttenstadt along the Neisse and Oder Rivers. 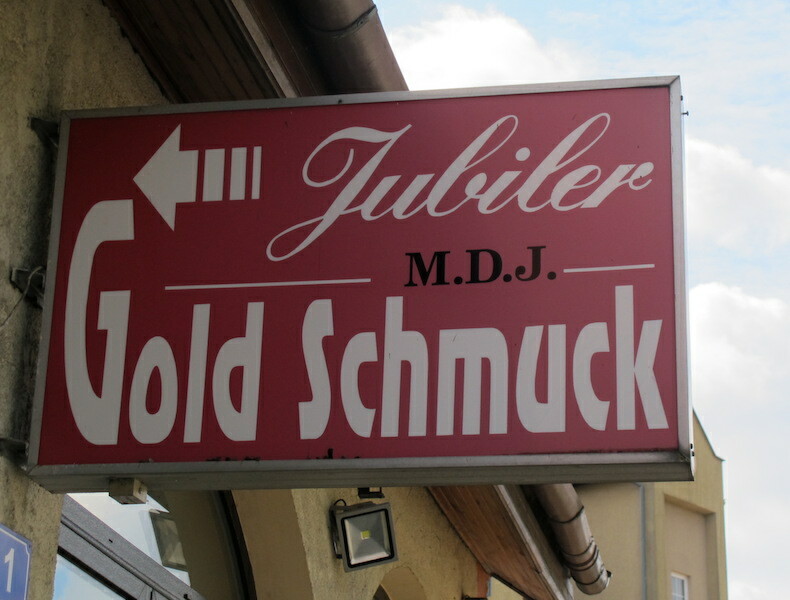 Juwibler Gold Schmuck…. gold jewellery, of course.